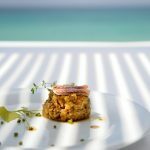 Sani Gourmet, the internationally recognised gastronomic festival hosted each year at the award-winning Sani Resort will be returning for its 13th year in Halkidiki, Greece. This year’s event will see the resort proudly welcome eight Michelin-starred chefs, together with the industry’s new gastronomic talents, offering foodies a unique dining experience. The ‘Rising Stars’ theme, now in its third year, highlights culinary innovation and flair, and will take place from 11th-15th May 2018. For five days, the chefs will cook in the kitchens of Sani Resort’s Water, Fresco, Katsu and Byblos restaurants. Since its conception in 2006, Sani Gourmet has hosted 100 chefs with a grand total of 59 Michelin Stars, creating tantalising dishes to the 14,500 guests who have attended. Among the chefs taking part in this year’s festival are Saverio Sbaragli, an one-starred Michelin awarded Italian chef, the Executive Chef of Hakkasan Group Akira Back and the minimalist Remco Kuijpers, who has risen to Michelin stardom in Holland. In addition, Bjorn Swanson, who secured a Michelin Star just six months after the opening of his restaurant Golvet, one-star awarded Paulo Airaud, master of French and Japanese fusion cuisine Ryohei Kawasaki and Umberto de Martino who was recently recognised with his first Michelin Star. A full programme and details of the chefs will be released shortly. For reservations please contact Sani Resort Reservations Department and ask for the special offers on dinners and room rates. Sani Resort Reservations Department: +30 23740 99586, +306948379719. All Dinners start at 20:30. All the dinners are adults only. Ticket holder accepts that he might share a table with other participants. In case that the ticket holder shows up late after the commencement of the dinner, his serving will start from that point and on as with the rest of the participants. Sani Gourmet reserves the right to change the chefs without further notice. For more information please contact the Sani Resort Front Office Desks.